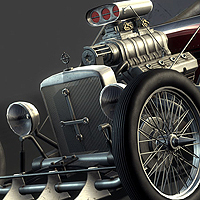 Ever wanted to know how the artists create those amazing cars for AAA video game titles? Well here's your chance to find out. In this incredible Tuts+ exclusive tutorial series, you'll follow professional CG artist and teacher Laurens Corijn, as he creates a high quality, next-gen, normal mapped Hot Rod for real-time use.